Roger Ebbatson is visiting professor at Loughborough University, having taught previously at the University of Sokoto, Nigeria and University College Worcester. His publications include Lawrence and the Nature Tradition (1980), The Evolutionary Self (1982), Hardy: Margin of the Unexpressed (1992) and An Imaginary England (2005). In the 1990s it was the French theorists such as Derrida, Lacan and Foucault who, with their stress on linguistic play and undecidability, took Victorian Studies by storm; now, it seems, it is the Germans who are coming. In Roger Ebbatson’s new book, Marx, Simmel, Benjamin and, above all, Heidegger are unleashed on a range of Victorian texts – some unsuspecting, some all too suspecting. The results are alarming: Ebbatson begins with Tennyson overshadowed by empire and homosocial tensions and ends with Conan Doyle writing about a bicycle belonging to a character called Heidegger. In between, he makes bone-shaking progress over a Victorian terrain marked out by Thomas Hardy, Richard Jefferies, Gerard Manley Hopkins, and Robert Louis Stevenson; along the way, Ebbatson considers shipwrecks, money, nature, the South Seas Mission, and ‘final solutions’. Tennyson, we discover, was afraid of his own shadow, Hopkins’s greatest poem was created by erratic compasses, Hardy wrote like Kafka, Stevenson was drawn to murderous missionaries, and Conan Doyle applauded the concentration camp. Ebbatson shows us that what the Germans bring to our understanding of the nineteenth century is a terrible awareness of the darkest moments of the darkest moments of the twentieth century. In this startling new book Roger Ebbatson adopts the unusual strategy of recycling Victorian writing through the bone-crunching machine of Germanic thought. The results are dramatic, as it quickly becomes clear that Nietzsche is not the only German to ‘philosophise with a hammer’; it turns out that to reread Victorian literature via Germanic thought is to take a hammer to that literature, to do a kind of a violence to it. Make no mistake, Ebbatson’s school of criticism is the school of hard knocks. The reader is likely to be rewarded by Ebbatson’s close attention to textual detail and by his innovative and thought-provoking approach to the analysis of nineteenth-century literature. As someone fascinated by A Laodicean’s obsession with radical indeterminancy, occlusion and the ‘blankness’ which for Ebbatson typifies ‘the entire action’ (p. 60), I have been disappointed by the tendency of some recent commentators to pass over the novel in faintly embarrassed silence. 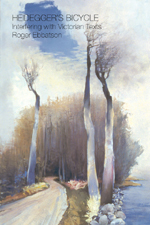 Ebbatson by contrast scrutinises the myriad moments of ‘undecidability’ not only in this unjustly neglected text but also in works by Tennyson, Richard Jefferies, Wilkie Collins (The Guilty River), Gerard Manley Hopkins, Robert Louis Stevenson (The Ebb-Tide) and Conan Doyle…. This is a richly rewarding book whose stringent analysis of Hardy is matched by its subtle ability to tease out the difference and disjunction inhabiting the Victorian text generally. Recommended. The theoretical premise of Roger Ebbatson’s latest book is designedly a disorientating one: to read works of various canonical Victorian writers – Collins, Hardy, Tennyson, Stevenson, Hopkins, Conan Doyle – for moments where their imaginative scenarios echo or prefigure the cultural preoccupations of some of the most formidable and austere of twentieth-century Germanic thinkers. Adorno, Heidegger, and Benjamin are the presiding spirits of Heidegger’s Bicycle, but other European figures (in particular Gadamer, Arendt, Derrida and de Man) are less overt but important influences throughout. Such a description could not, though, capture the singular and radical thrust of a book that takes these familiar literary texts not as illustrations of later modes of reading but as exemplary anticipations, works which encompass later conceptual routes or paths, and which are ever-full of all kinds of strange historical intimation. Ebbatson’s aim, in the process, is to hammer open the false identity-effects, ‘the marmoreally institutionalized’ surfaces, of these texts, ‘in a strategy of critical “interference” based mainly in German critical thinking.’ As John Schad puts it in his scintillating foreword, this is a book in which ‘Victorian England’ can turn ‘quite bizarrely, into twentieth-century Germany’. ... Audacious though the book may sound, and is, it is perpetually stimulating, invigorating, and revealing to read, and its untimely procedures certainly fulfill Ebbatson’s aim of making the two traditions of writing mutually illuminating. Ebbatson is also the most congenial companion one could wish for, at once lucid and knowledgeable in his command of a huge range of texts and contexts, and ludic in his awareness of the risks he takes. At times, I confess, I found the densely connective texture of some of the discussions challenging, but Ebbatson’s rhizomatic pursuit of uncanny correspondences and transfers is an index of the book’s openness to the power of literature to confound logic and history, and to mean more than it might seem to say. Roger Ebbatson has achieved exactly what he set out to do in Heidegger’s Bicycle, blasting his nineteenth-century texts (in the kind of machismo Benjaminian parlance that Ebbatson himself is intermittently fond of) out of the continuum of history – mainstream English literary history, in this case – and, through his chosen German theorists, opening them forcibly up to other places, other temporalities. There is no work of art that is not simultaneously a work of barbarism, as Walter Benjamin once insisted; and Roger Ebbatson has powerfully enforced that point in his fine series of readings in this book, above all in relation to the Holmes stories. Victorian texts time and again marked the ‘dialectical connection between mechanism and metaphysics’ (25). And as Roger Ebbatson teaches us, in a sensitively attuned analysis that stretches from Tennyson’s ships to the post-holocaust poetry of Paul Celan, from the ‘apotheosis of Enlightenment Metaphysics’ and the emergence of technologies of modernity to the ‘apocalyptic Scene’ of National Socialism, Victorian texts struggle to come to terms, often quite literally, with the consciousness of becoming-modern, becoming historical as Tim Armstrong might put it (141, 118). In this, Ebbatson succeeds with telling, precisely measured force, to ‘chip away at the marmoreally institutionalized surface of…Victorian texts’ (1), allowing his readers the necessary if indirect apperception of an other Victorian culture, a culture of everyday modernity which is the parent of our own present technologically corralled crisis of consciousness. Information is provided under the Resources tab. e-Book type availability can be sourced via www.ipgbook.com by book title. Kindle availability is via Amazon .com and .co.uk sites.